Are you looking for something efficient and durable to get you around the city streets? 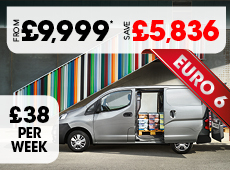 Look no further than the Renault Kangoo. This versatile series of vans comes in a wide range of variants to suit your specific needs. All feature generous load volumes relative to their size, and in the cabin you’ll find plenty of internal storage as well as helpful technology like USB, AUX and Bluetooth radio. If it’s a larger van you're after, then the mighty Trafic may be the van for you. It too has many variants, including panel van, crew van and passenger versions. So, no matter your needs there’s a van for you. Depending on your trim, you can enjoy heated electric door mirrors, DAB radio with Bluetooth, air conditioning and cruise control. We’re unbeatable in terms of price. Our price promise guarantees you won’t pay less anywhere else. In addition, we offer many competitive finance offers. Our friendly team of experts would be happy to help you find a package to suit whatever budget you have. Our Renault van stock is regularly updated, why not view our current models online or come down to visit our showroom in North Cheam? Our team of Renault experts would be delighted to answer any questions or take you on a test drive today.